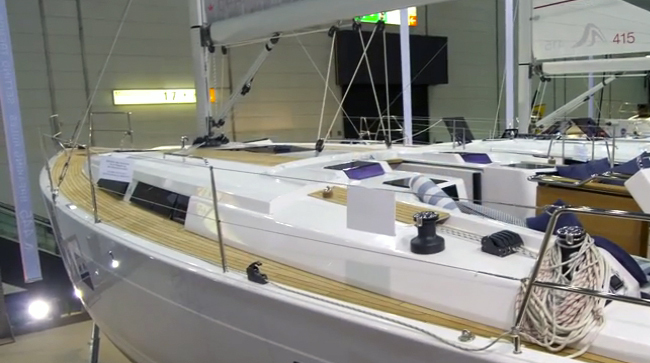 What happens when a German sailboat manufacturer engineers a new top-tier model? In this case, the result is ridiculous fun factor. 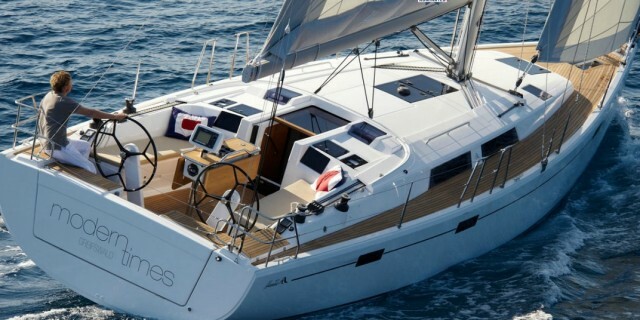 Like the rest of the 5 series line, the Hanse 415, with her plumb bow and low cabintop, looks serious and fast – think BMW. The styling even has a slightly predatory look, and reminds you of a shark on the prowl. 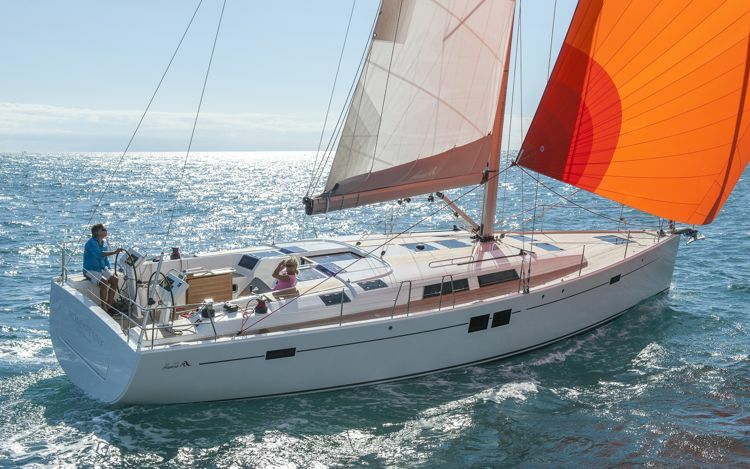 The waterline was extended two feet over her predecessor, the popular Hanse 400, and is over three feet longer than the next model down, the Hanse 385. Since the sail plan was kept the same, it suggests that the 415 should be a tiny bit faster. She’s also a foot wider than the 400, which provides more room in the interior, perhaps a ten percent increase. The German styling is as apparent in the look of the Hanse 415, just as the engineering is apparent in the way this boat handles when single-handed sailing. We took the 415 out on a calm day in California and had unexpected amounts of fun even on a wind-challenged day. The complete lack of drama in sail management and tacking made this reviewer want take her out on a windier day, even completely singlehanded. Because the shrouds are attached well outboard the decks are wide and clear, moving around aboard is easy. Flush hatches and few toe-stubbers means quick progress can be made from the anchor locker forward, all the way aft to the manually-operated drop-down transom that forms a terrific swim platform. The cockpit segregates the social area forward from the control hub aft. But for racing, there’s still plenty of room for crew to attend to winches without feeling cramped. The standard keel is T-shaped and draws 6’ 9” but for skinny water you can opt for the L-shaped shoal keel that saves 1’ 2” in draft. Up top, the 415 is driven by a self-tacking jib which is ideal when sailing shorthanded, and a standard main which you can tame with either lazy jacks and a StackPack, or in-mast furling. The fractional rig is deck-stepped and has mid-boom sheeting which is not ideal, but does keep the cockpit clutter-free. There are no winches on the coach roof. Instead, the space under the optional dodger is reserved for cubbies designed to hold sunglasses, cellphones, tubes of sunscreen and the like. The halyard winches are farther aft on the cockpit coaming near the primaries and are within reach of the helmsman, which makes sense. A set of stoppers on either side frees these winches to be used for the optional gennaker if needed. Electric winches are an option for push-button sailing. The entire setup is ideal for sailing short-handed and even if you have a boat full of people, there’s no need to disturb the social area in the cockpit because all controls (lines, gauges, engine levers, etc.) are aft and out of the way. I don’t, however, care for the placement of the charplotter on top of the aft end of the folding cockpit table. It will be a target for those who lose their footing when the boat heels and then grab for the first thing they see. The rock star black carbon wheels really add a serious look to the cockpit and will make anyone feel like a racer. Jefa steering from Denmark is standard and makes the wheels light and responsive, so you can pretend you’re racing with one finger on the wheel and a beverage in the other hand. Pretend racing can be thirsty work. Multiple interior options mean you can semi-customize the 415 to include a work station, settees, and many different interior layouts. 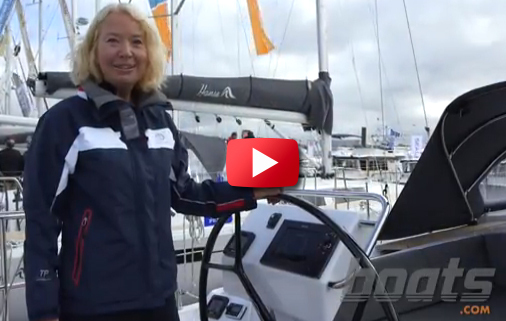 The Hanse 415 is a production boat but it offers dozens of customization options. The choices go beyond the usual menu of interior fabrics and wood tints to complete layout and configuration differences because the boat is modular. The master stateroom is in the forward section, with or without an optional head. The middle section holds the saloon, main head and changeable galley. 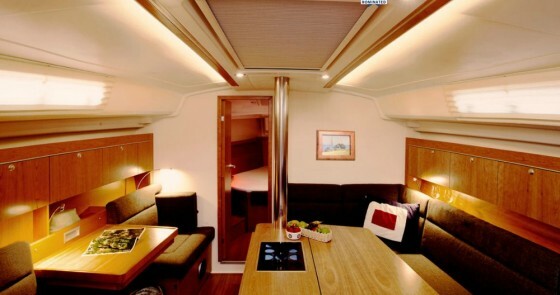 The aft section offers two cabins or one with a starboard-side workroom and/or lazarette. The owners gets to decide what combination of all the above will suit their needs best. The standard, and my favorite, is a two-cabin, one-head version with the enormous stowage compartment accessible via the cockpit or interior doors. The aft cabins are of decent size but have sparse stowage. The galley (long or short version) could use the upgrade to the three-burner stove and microwave oven. Drawer refrigeration is a nice touch that is more and more prevalent on sailboats everywhere. Opposite the galley is the head with separate stall shower, which to me, is a must-have. The saloon is bright due to the twin (back to back) overhead hatches and the see-through polycarbonate companionway slider and drop-down hatch boards. To starboard is a U-shaped settee with a drop-down table that turns into a berth and to port is a navigation station that also drops down on struts, to form a straight settee for either extra dinner seating or a sea berth. The table between the two folds up to join together a large dinner party. The master stateroom is forward with a simple V-berth. There is lots of room in this cabin so some may choose to add the optional head. I’d prefer to see an island berth to avoid the inevitable knee-to-the-head routine as couples maneuver into bed. There is enough cabin length here to move the berth aft and create decent shoulder room in the peak. In the version without the second head, this might be a popular option for the American market. Like most of the production boats today, the interior design is angular and minimalist. This is a European preference that has grown on me and I think Hanse executes it better than many because the effect is elegant but not stark. A mahogany finish is standard with upgrades to American cherry or Italian oak available. Though minimalist in nature, interior decor is crisp and elegant on the Hanse. Tankage is relatively light for passage-making. The standard is 80 gallons of water but an extra tank can be added under the settee for a total of 125 gallons. 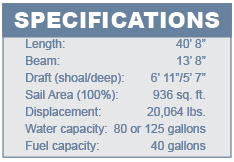 Fuel is only 40 gallons and will significantly limit range. For long distance cruising, I’d recommend adding a fuel tank, perhaps under the port aft cabin berth. Our test sail was on a warm December day in San Diego with brilliant sunshine but unfortunately, not much wind. Jeff Brown of JK3 Yachts demonstrated just how easy it was to sail this boat alone, primarily because after a few initial tacks and turns at the wheel, the rest of us settled into a lazy day of testing out the comfortable cockpit seats and seatbacks. This boat practically sails itself and is so effortless, we even short-tacked into the small neck of the harbor near the slip, just to extend the fun. This boat begs to be taken out regardless of the conditions or the number of crew. It is the kind of boat you can truly sail alone because in heavy wind, the self-tacking jib acts as an extra hand aboard. When the wind is light, like on our test, the optional gennaker will spice things up and we wished we’d had one on our test. With just the jib, we squeezed out boat speeds of three to five knots in apparent wind of five to eight knots. It would have been better to test her in a blow, and polar diagrams suggest she’ll sail at 6.7 knots in a 14 knot breeze at 40-degrees apparent wind angle. With 20 knots of apparent wind speed on a beam reach, the top end should be over nine knots. 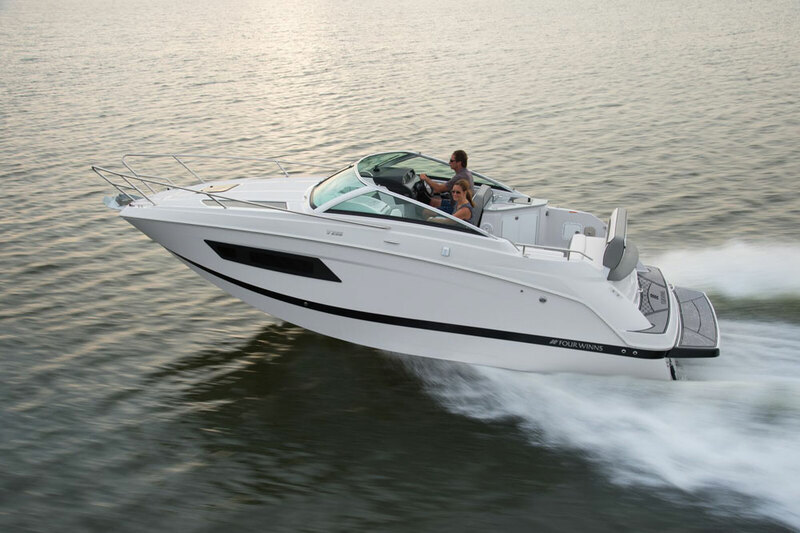 Under power, the standard engine will push the boat in flat water around seven knots at 2600 rpm. 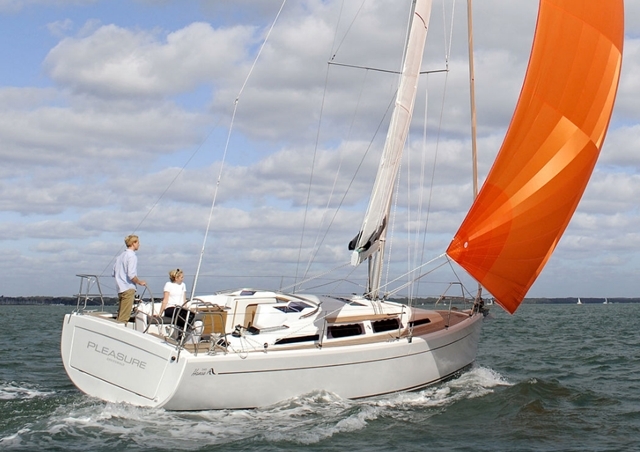 I like the Hanse 415 for a lot of reasons but primarily because it’s not fussy. Sure, it’s stylish, strong, sleek and of good build quality, but the key thing is to use a boat and this one is so fuss-free to singlehand, it would be easy to take out anytime regardless of whether friends or family are available to come along. The base price of the Hanse 415 is $207,000 but with commissioning and loads of extra goodies, our test boat came in at $298,000. Other extras will bring that a bit higher, but German engineering, good looks and easy sailing for around $300,000 is not bad. The standard layout that has two cabins and one head and provides good value as it is the least expensive version and in my view, is also the best one for a cruising couple. Options, add-ons and upgrades I’d seriously consider would be the Simrad navigation package with radar/chartplotter and autopilot, the larger 55 hp, engine, gennaker, electric windlass, extra house battery and a much larger inverter to run the microwave away from the dock. For easy maneuvering, you might also add the bow thruster. There are now eight models in the very successful 5 series line ranging from 32 feet all the way up to the serious offshore Hanse 545 cruiser and the all-new 575. Hanse is developing their dealer network around the world and is providing good volumes for their state-of-the art production facility in Griefswald, Germany so it’s not only able to keep the prices sane, it is poised to make real inroads into the US market. With owner feedback, they’re making improvement every day, which is great—just don’t mess with the fun factor. 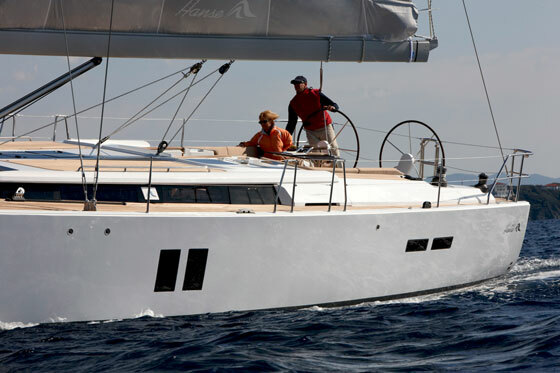 For more information, visit Hanse Yachts.